Read our facts and figures about cycle accidents and injuries. A cycle accident can happen anytime, any place, anywhere. 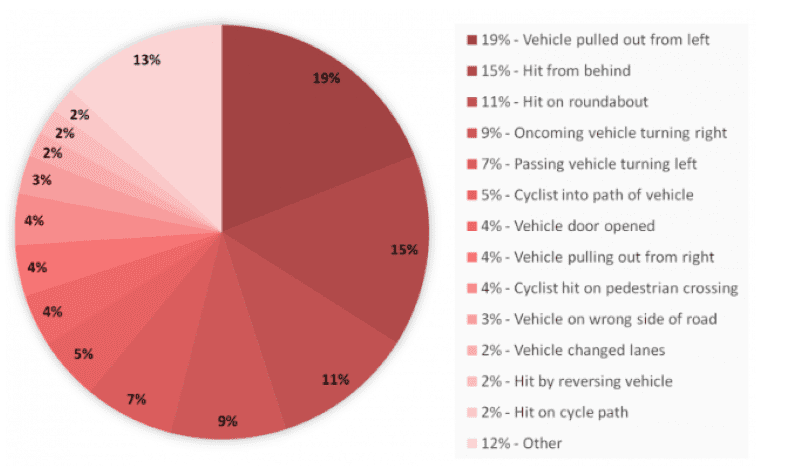 According to our data almost two thirds of cycle accidents occur at road junctions, with 26% of accidents being caused by a vehicle pulling out from the left either from a side road or on a roundabout. Notwithstanding the risk of imprisonment or a substantial fine, 8% of motorists fail to stop after an accident. This number is surprisingly high and no doubt includes accidents where the vehicle driver did not stop because they were unaware they had caused an accident. For those cyclists who think they are safe cycling in a cycle lane – think again! Our data shows that 7% of cycling accidents occur when the cyclist is in a cycle lane. It is perhaps no surprise that in collisions involving cyclists and vehicles, injuries to limbs are the most common, with around 85% of cyclists suffering arm or leg injuries. Lower limb injuries are the most frequent at 65% with upper limb injures being reported in 55% of cycle accidents. Around 35% of cyclists suffer both arm and leg injuries. The majority of injuries (53%) are soft tissue injuries, with almost 90% suffering multiple injuries. Again, it is the arms and legs that are the most vulnerable with 54% suffering arm injuries and 67% suffering leg injuries. Bone fractures, ranging from broken collarbones and shoulders to broken legs and fractured skulls, are common and are reported in 1 in 4 cycle accidents. The prevalence of head injuries is alarming with 23% of cyclists suffering some type of head or facial injury, and 8% suffering what we would describe as a serious head injury, for example where the victim was knocked unconscious, suffered concussion, sustained a skull fracture or brain damage.